Now that the kids are back in school, you want to give them a special treat. Lucky for you, two spectacular shows have just arrived in town and both look very promising. However, some of your family members are a bit picky – they want to be riveted in their seats by daring and breathtaking performances. Deciding what show the kids would most enjoy can be tough, but High 5 Casino has two incredible options that are likely to entertain even the pickiest family member! Grab your Stetson and saddle up! Head on over to Western Champions, the wildest show in the west, with gunslinging outlaws and true American cowboys and cowgirls. You and your family are in for a real treat with this tribute to the American Wild West! The performers here will impress you with their amazing rope tricks and the best gun spinning east of the Mississippi! You’ll hold your breath when the knife thrower takes the stage to perform his most daring act yet! You’ll become enthralled by the riveting burlesque dancers with their world famous dancing! This show will make you feel like a true outlaw in the Wild West. Don’t own a Stetson? No problem! Bring your family instead to the colorful center ring of Circus Treasure. You’ll love seeing the spectacular performers take the ring. Indulge in peanuts and cotton candy as you wait for your favorite acts to appear! Watch the imposing strong man lift hundred pound weights with ease or see the elegant tightrope walker glide across the thin rope twenty feet above you. Marvel at the beautiful fire breather’s feisty act. Stare in suspense as the wild human cannonball is launched into the night’s sky! The charming ringmaster invites you to the most magnificent show on earth! 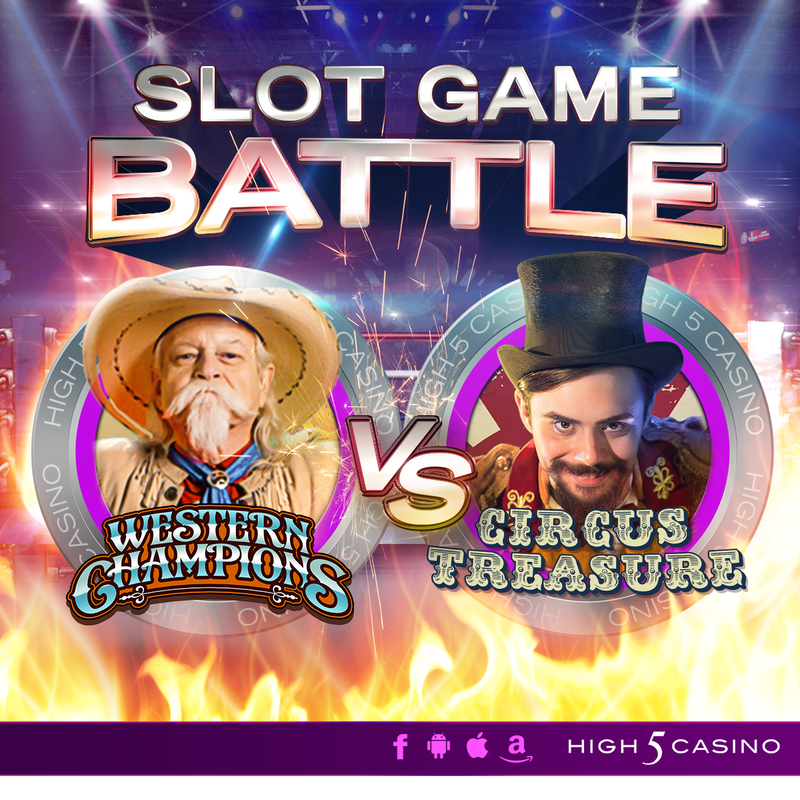 Will you choose the American Wild West or the Big Top? Which show do you think will have the best performers? Who are you most excited to see? Which show will you choose? Comment in the conversation bubble located on the top right corner of your screen and let us know! This entry was posted in game preview, High 5 Casino, High 5 Games, High 5 Moments, Slot Game Battle, top games and tagged Android, App Store, Apple, Back to School, Back to School Fun, Big Top, Circus Treasure, Facebook, Free Games, game preview, Game Spotlight, Game Vs. Game, game vs. game breakdowns, Google Play Store, High 5 Casino, High 5 Casino Mobile, High 5 Games, iOS, iPad, iPads, iPhone, iPhones, mobile gaming, Shake the Sky Casino, Slot Fundamentals, slots, social gaming, Western Champions, Wild West by hoothigh5. Bookmark the permalink. I love cowboys thre are the best because they have horse and my family and i love riding them and take care of them. Circus Treasure will win the day. I love to be entertained and they do it right!! I like Western Champions. Never do well at Circus. Always have had horses in our life so you know what my pick would be.